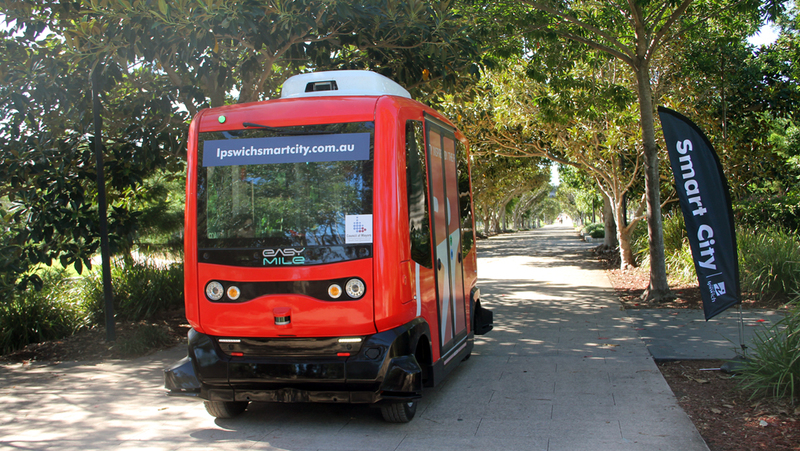 The City of Ipswich recently partnered with EasyMile and Transdev to feature a public demonstration of the EZ10 driverless shuttle in Springfield. This demonstration provided an opportunity for the citizens of Ipswich to experience the future of transport and an introduction to fully autonomous (self-driving) shuttle technology. The Ipswich Smart City Program is defined by principles and outcomes measured by industry advancement, skills development, community prosperity and liveability. As we evolve in our Smart City journey through key learnings via pilot projects we continue to establish the city as an international testbed for innovative smart city partnerships, applications and learning. The City of Ipswich is a globally recognised leader within the Smart City space where electric driverless technology is aligned to the long term transport solutions we are investigating for our citizens. Able to carry up to 12 people (6 seating, 6 standing), with an access ramp ensuring accessibility to people with disabilities. Free public demonstrations of EasyMile’s EZ10 fully autonomous shuttle took place from Monday, 26 February to Saturday, 3 March 2018 and travelled from Orion Lagoon along John Nugent Way. We would like to acknowledge the support of the following partners: EasyMile, TransDev, Telstra, Springfield City Group, University of South Queensland, SEQ Council of Mayors.